511.org: San Francisco Bay Area Transit Transportation - Provides instant online access to transit information for the nine-county San Francisco Bay Area, and is supported by the Metropolitan Transportation Commission (MTC). 511 RideMatch Service - An interactive, on-demand system that helps you find carpools, vanpools or bicycle partners. Here, you can quickly create a profile and find commuters who have similar travel routes and patterns and with whom you can share a ride. The system also lets you easily send potential rideshare partners an e-mail or give them a call. AC Transit - The Alameda-Contra Costa Transit District (AC Transit) serves Western Alameda and Contra Costa Counties, with transbay service to the San Francisco Transbay Terminal. Alameda-Oakland Ferry Service - Ferry service. Amtrak - U.S. rail service. Amtrak Train Routes: California - The trains with connecting service to Amtrak Thruway buses reach more than 90 destinations in the Golden State, including travel destinations such as San Diego, Los Angeles, Santa Barbara, San Francisco, Sacramento, etc. Learn more about individual routes. Angel Island-Tiburon Ferry - Ferry service. Bay Area Transit Maps - Regional transit maps. Bay Bridge Public Information Office - The seismic retrofit work on the Bay Bridge is being performed through a series of complex projects. Several of these projects have already been completed, including the seismic retrofit of the bridge's West Span, between San Francisco and Yerba Buena Island. The East Span is being entirely replaced. The estimated date opening the new bridge to traffic in both directions is 2013. BayPorter Express Airport Shuttle Service - Featuring shared-ride Door to Door and Charter service from your home, business, or hotel. BayRail Alliance - Advocate for improvements to rail public transit in the San Francisco Bay Area. BeatTheTraffic - Check live traffic conditions in across Northern Californaia. Processes and integrates real-time road traffic and weather information from numerous public and private sources, predicts traffic patterns and suggests routes so users can arrive at their destinations rested and ready. Bicycle-Friendly Berkeley Coalition (BFBC) - Mission is to make Berkeley a more bicycle-friendly city. Blue & Gold Fleet - San Francisco Bay cruises. Sausalito, Tiburon, Marine World, Jack London Square in Oakland, Federal Penitentiary, San Francisco City tour, Vallejo, Sonoma-Napa Carneros Wine Region, Angel Island. Blue Bird Cab Tri-Valley - In business since 2005 engaging taxi services in the Tri Valley Area like Pleasanton, San Ramon, Livermore, Dublin and Danville CA. Provides shuttle services at OAK, SFO, and SJC Airports. Bridges of San Francisco - Dumbarton Bridge, San Mateo-Hayward Bridge, San Francisco-Oakland Bay Bridge, Richmond-San Rafael Bridge, Carquinez Bridge, Benicia-Martinez Bridge, Antioch Bridge, Golden Gate Bridge. The Bay Area District 4 Office of Caltrans is responsible for maintenance, operation and administration of the 7 state owned toll bridges on San Francisco Bay. The Golden Gate Bridge is run by the Golden Gate Bridge Highway and Transportation District, a regional agency that also operates buses and ferries between Marin and Sonoma Counties and San Francisco. California High Speed Rail Authority - The body charged with planning a network of high-speed-train service in California. California Traffic Information - Traffic and traveler information portal for California. Caltrain - Commuter rail service between San Francisco and Gilroy via San Jose and continuing bus service to Santa Cruz. Caltrans Live Traffic Cameras - Caltrans has over a thousand cameras monitoring freeway sections across California. Caltrans Quickmap - Presents several types of California real-time traffic information layered on a Google Map. CBS San Francisco: Traffic - Live traffic reports San Francisco, Oakland, San Jose. City CarShare - Car sharing program where members can use cars at locations throughout San Francisco, Oakland and Berkeley, without having to own the car. Clipper - Clipper is an all-in-one transit card that keeps track of any passes, discount tickets, ride books and cash value that you load onto it, while applying all applicable fares, discounts and transfer rules. This lets you customize your card for your own transit needs. The Clipper card can hold multiple passes, ride books or tickets (which are specific to the transit system being used), as well as up to $300 in cash value at one time. Cash value on your Clipper card can be used to ride any participating transit system. Commuter Check - Part of Accor Services North America. The Commuter Check solution has served the U.S. transit industry since 1990, providing transportation voucher services for more than 8,000 employers and 150,000 employees in cities across the country. For example, Commuter Check has served the San Francisco Bay Area since 1991, and a 2006 survey of Bay Area Rapid Transit District (BART) riders confirmed that over 60 percent of employed peak period riders now receive transit benefits from their employer (either as fare subsidy or employee-paid pre-tax payroll deduction). County Connection - The Central Contra Costa Transit Authority service in Central Contra Costa County with connections to Pleasanton and Antioch. Flight Delay Information - Provided by the Federal Aviation Administration. Golden Gate Ferry - Ferry service. Golden Gate Bridge, Highway and Transportation District - Operates Golden Gate Transit, Golden Gate Ferry, and the Golden Gate Bridge. Harbor Bay Maritime - Alameda - San Francisco ferry service. Harvest Vacation Charter Bus Service - Provides professional bus charter services to San Francisco, the bay area and the west coast. Hornblower Cruises and Events - Each year Hornblower Cruises and Events operates over 5,000 yacht charters, public dining cruises, and sightseeing tours from five ports in California (San Francisco, Berkeley, Marina Del Rey, Newport Beach, San Diego, and South Lake Tahoe). KCBS 740AM - Bay Area traffic page. KGO 810AM - Live traffic reports. KRON 4 - Traffic cams and live traffic reports. KTVU Traffic (BayInsider.com) - San Francisco Bay Area, San Jose and Oakland Traffic, Bay Area Bridges, FasTrak. Leap Transit - Private bus line fror daiily commutes in San Francisco. Luxor Cab - Computer dispatched taxicab service. (415) 282-4141. Metropolitan Transportation Commission - The transportation planning, financing, and coordinating agency for the nine-county San Francisco Bay Area. Muni Dairies - Your place to share transit stories. Embacadero Center Garages - Embarcadero 1-4. Embarcadero Center is located in between San Francisco's Financial and Waterfront Districts, running from Battery to Drumm Streets, in between Sacramento and Clay Streets. Red and White Fleet - Cruise and tour operator in Fisherman's Wharf. Bay cruises, land and air tours, ferry services, charters. Red Hawk Casino Bus and Shuttle Services - View schedules, pricing and special offers for this service that takes you in comfort from San Francisco to the Red Hawk Casino in Shingle Springs, California, 41 miles East of Sacramento. In San Francisco, buy tickets in person in advance after 2:00 pm M-F at 721 Commercial Street (bet. Clay and Sacramento Sts.). Leaves SF daily at 8:00 am and 8:15 am from Kearny St. & Sacramento St. Trip takes 2 hours. Casino stay of 4 hours, then return to SF. So return is at 2-2:30 pm. Service provided by Kenny Express, (415) 398-2009. Rescue Muni - San Francisco's transit-riders advocacy group. RIDES for Bay Area Commuters - Dedicated to helping you find and use alternatives to driving alone. Carpool and vanpool referrals from our database of over 12,000 commuters. Bicycle information and referrals. Assistance to take public transit or telecommute. Information on using diamond lanes, Park & Ride lots, Commuter Check, and more. SamTrans - Service throughout San Mateo County with connecting service to San Francisco, the Transbay Terminal, and Palo Alto. San Francisco Bay Area Traffic Report - Provides real-time updates on traffic road conditions for the San Francisco area. Review live SF traffic alerts for accidents, construction, traffic jam, school traffic and other road conditions and transit delays. San Francisco Bicycle Coalition (SFBC) - Seeks to transform San Francisco's streets and neighborhoods into more livable and safe places by promoting the bicycle for everyday transportation. 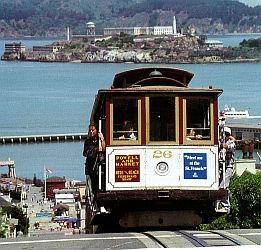 San Francisco Cable Cars - Web's first interactive cable car. Features include: interactive demos on how cable cars work, route maps with popular destinations, and the location and hours of the San Francisco Cable Car Powerhouse. Also see Wikipedia article and the San Francisco Cable Car Museum. San Francisco Cityscape - Transit maps. San Francisco County Transportation Authority - Administers and oversees the delivery of the Proposition K (Prop K) half-cent local transportation sales tax program and New Expenditure Plan, which was passed by 75% of San Francisco voters in November 2003. Since 1990, the Authority has also been the designated Congestion Management Agency (CMA) for San Francisco. In this role, the Authority is responsible for developing and administering the Congestion Management Program (CMP). Through its CMA activities, the Authority has been able to leverage state and federal transportation dollars to complement Prop K revenues. San Francisco International Airport (SFO) - SFO information via the web. Also see SFO Airport Information, Airport Status, OAG Flightfinder, and SFO Airport Shuttles. San Francisco Parking: ParkMe - Find best places to park in San Francisco. San Francisco Port Commission - The Port of San Francisco is governed by a five member Board of Commissioners, each of whom is appointed by the mayor subject to confirmation by the City's Board of Supervisors. Sanmo Travel - A full service bus charter and travel agency with branches in San Francisco, Oakland, and Daly City, catering to the diverse ethnic communities of the three cities. SF Gate: Traffic - Live traffic reports, articles and information from the San Francisco Chronicle. SF.Streets.Blog - A daily news source connecting people to information about sustainable transportation and livable communities. StreetsBlogSF - Covering the movement to reduce dependence on private automobiles and improve conditions for pedestrians, cyclists, and transit riders in San Francisco. SuperShuttle - Blue and yellow vans take you to the airport from your home, office or hotel and bring you back after you land. To keep prices low, you give a small amount of your time, and share the ride with a few other passengers. Tideline Water Taxi - The City's first water taxi service, taking you to docks in San Francisco, Marin and a few points in between. Navigable areas of operation is the San Francisco water front, Richardson Bay, Raccoon Straight, Oakland inner harbor, Richmond inner harbor. 511 SF Bay Area - 511 is your one-stop phone and web source for up-to-the-minute transportation information. Available whenever you need it - 24/7 - from anywhere in the nine-county Bay Area. 511 Traffic - Comprehensive traffic information source for the Bay Area. Provides on-demand, up-to-the-minute traffic conditions and driving times for your route. Complements the 511 phone service and offers free information and tools. Transbay Blog - Transportation and urban planning in the San Francisco Bay Area. TRANSFORM - The Bay Area's main alternative transportation advocacy group, TALC is a partnership of over 90 groups who advocate "smart growth" through linking transportation with land use. Transportation Management Association of San Francisco (TMASF Connects) - A community service of San Francisco commercial office buildings working together to help commuters explore trip options, promote and enhance the City's workforce, and identify quality daycare services. Uber San Francisco - The Uber app can connect you with a reliable ride - from low-cost to premium - in minutes. Payment is automatic through the app and fares are usually cheaper than a taxi. Upshift - Get a Prius delivered to your door with one text. Return it anywhere in Upshift's delivery zone in San Francisco when you're done. Vallejo Baylink Ferry Service - Ferry service. VTA - Santa Clara Valley Transportation Authority service providing bus and light rail service in Santa Clara County. Walk San Francisco - A coalition of organizations and individuals that seeks to improve San Francisco's walking environment through activism and policy advocacy that educates residents, city agencies, and elected officials regarding the need for more pedestrian-friendly streets. WebTrak - Using WebTrak you can track the flight activity into and out of selected airports, along with information about each aircraft. Yellow Cab - GPS dispatching locates the closest cab. (415) 333-3333. Zipcar - Zipcars live in your neighborhood! Drive MINIs, VWs, cars that haul and more. By the hour or day. Includes gas, insurance and parking. Simply reserve online, walk a block and drive away. This webpage last updated on Tuesday, November 6, 2018 5:44 PM.